A WELSH hunting pack has been suspended following allegations that its practices were “barbaric”. Action was taken against the Plas Machynlleth gun pack after undercover investigators from the League Against Cruel Sports infiltrated the group during the 2003-04 hunting season. 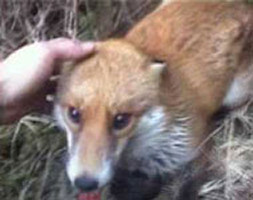 The film appears to show dogs fighting a fox, a fox screaming while trapped by terriers below ground, and terriers encouraged to savage the dead fox before it was thrown to waiting hounds. The league wants the law changed to make the practice illegal. After the league’s report, called Digging the Dirt, was released, the Federation of Welsh Packs, the governing body designed to unite and represent organised hunting in Wales, announced it had suspended the pack pending an inquiry. A spokesman on behalf of the Mid Wales pack said last night that members had not been allowed to see an unedited version of the film, and they suspected it had been highly edited. Douglas Batchelor, chief executive of the League Against Cruel Sports, called the footage “sickening” and appealed to the Government to completely outlaw fox hunting and baiting by dogs. He said, “This just sickens me to the core. This is just one of 40 gun packs in Wales. “The problem with this is that everything on the film is currently legal, there is not a single thing done there that would actually be against the law as it stands. The league says it uncovered evidence including hounds incapable of killing a fox with a quick nip to the back of the neck and terriers attacking a trapped fox, which was screaming while being dug out. “This has no place in modern society,” said Mr Batchelor. “The Hunting Bill [which failed in Parliament last autumn] should be brought back to make all of this a crime. They often say this is pest control, the league says this is blood sport. The league is lobbying the Westminster Government to reintroduce and pass the Hunting Bill. Cardiff North MP Julie Morgan joined the league in condemning hunting. She said, “I was shocked and sickened by that footage and what I saw appeared absolutely barbaric. “If this is happening then it is unacceptable and I would be ashamed that this is happening here in Wales. David Thomas, of the Federation of Welsh Packs, said an inquiry will be held into the claims. He added, “They [the gun pack] are suspended as of today and we will hold an inquiry as soon as we get the evidence together. “Hunting takes place extensively in Wales but we as a federation have high welfare standards. Anyone that breaches those standards will have to look at what’s going on. “We are going to hold an inquiry in to the allegations that the rules and regulations have been breached. He added that the pack’s huntsman had assured him that the fox had been put down humanely and was only afterwards given to the hounds, which Mr Thomas described as “standard practice”. Members of the hunt were lambing yesterday and were not available for comment. But Adrian Simpson, also from the Federation of Welsh Packs, speaking for the Plas Machynlleth pack hunt, called for the league to provide full unedited footage. He said, “We haven’t had the benefit of seeing it. We sent a representative who asked them if we could have a copy of the tape. “The hunt has immediately been suspended, pending an inquiry but we do need a copy of the tape. “It appears the tape was hugely edited and what we would like to see is a copy of it for us to conduct our investigations. On the face of it, it does not appear that any rules were broken. “The fox was shot before the carcass was given to the dogs, we are very suspicious of it all. We are suspicious the tape has been heavily edited.